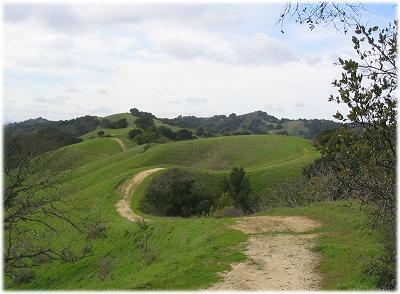 The Volunteer Trail Safety Patrol serves the East Bay Regional Park District in California's San Francisco Bay Area. It comprises five patrol groups: the Volunteer Mounted Patrol, the Volunteer Bicycle Patrol, the Volunteer Hiking Patrol, the Companion Dog Patrol, and the Volunteer Marine Safety Unit. Members of those groups may also participate in the District's Search and Rescue (SAR) unit. 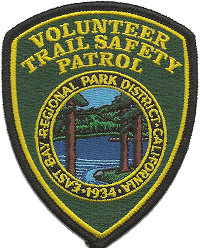 Volunteer Trail Safety Patrol members, frequent and enthusiastic visitors to our regional parklands, are dedicated to preserving the safety of the public and of the East Bay Regional Park District's natural and historical resources. Volunteer Trail Safety Patrol members also educate visitors about East Bay Regional Park District resources, programs, facilities, and rules; observe and report safety issues, incidents, and emergencies; foster positive relationships among user groups; and assist at some public events in the East Bay Regional Park District. Read more about the Volunteer Trail Safety Patrol and learn more about your trails and parklands in the East Bay Regional Park District. This Web site is the property and responsibility of members of the Volunteer Trail Safety Patrol. This Web site is not officially supported by the East Bay Regional Park District.